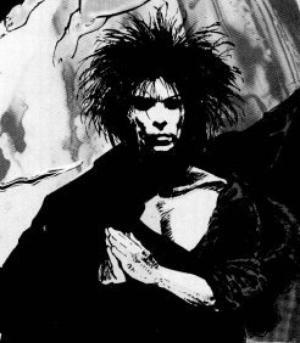 As you can imagine, I love Neil Gaiman’s The Sandman. It was, without a doubt, one of the more formative experiences of my life, literary or otherwise. Even moreso than Watchmen, really. I read it at sixteen and it was one of those explosive realizations of what literature could be. However, I’m not really here to talk about The Sandman. 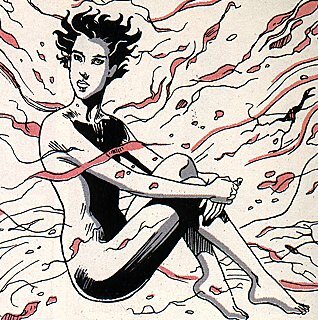 I’m here to talk about a cute little Sandman-related creation called The Little Endless. Okay so these are super-cute. 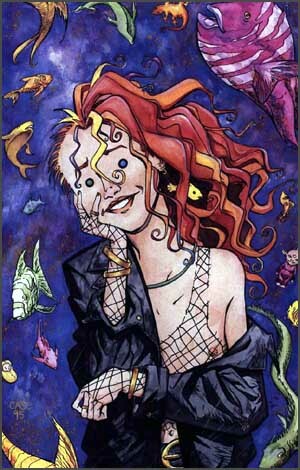 They were drawn by Jill Thompson, who who also did illustrations for a number of Sandman issues. The Endless are immortal beings, not quite gods but maybe they are gods, who represent seven “things” (for lack of a better word) that all living beings experience. From left to right: Desire, Despair, Delirium, Dream, Death, Destiny and Destruction. And yes, all their names start with the letter D. It is a thing. All right so since I’ve already started, I might as well talk about all seven of the Endless, since they are a remarkable creation. So Destiny is the oldest. He is the most mysterious (meaning dear Neil tells us the least about him). 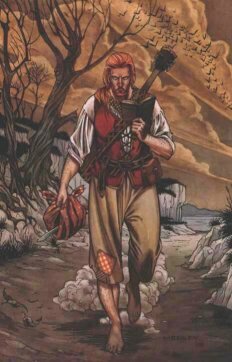 He is chained to his book, the Book of Destiny, which he must read at all times. He rarely leaves his garden. Destiny is blind. All living beings have a destiny, and all must die. Death is wonderful, and sweet, and quite lovely. She’s a fan favorite. She’s also been my go-to costume for several Halloweens. She pretty much always wears black, and her ankh. She’ll show you the time of your life. 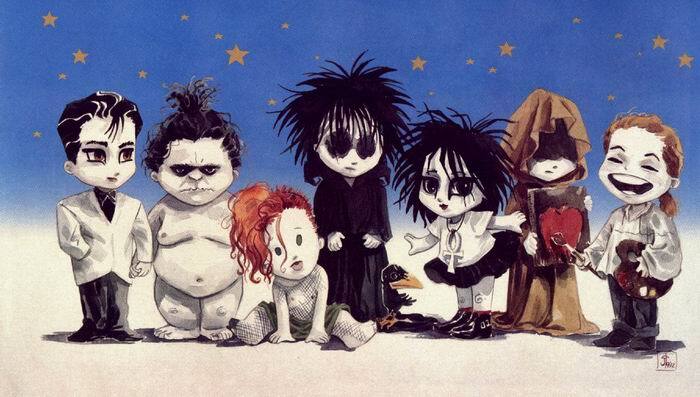 So Dream is the central character of The Sandman. He also goes by Morpheus. He’s tall, pale, and fairly humorless. I can’t say too much about him, since it is his series, but like all great heroes he has a tragic flaw. Destruction is the Prodigal, in that he didn’t want to deal with his role in the cosmos, and so he ran off to become an artist. He doesn’t have much artistic talent. Desire is the twin of Despair. Desire is neither male nor female, Desire is whatever you want. Desire floats in a temple of its own body. Despair is the twin of Delirium. She is a squat, round pale woman. She lives in a maze of mirrors, mists, and rats. Delirium is the youngest of the Endless. She will always be the youngest of the Endless. This is her tragedy. She used to be Delight. Her appearance changes according to her mood. So I said I wouldn’t go into how amazing The Sandman is, but I lied. The Endless are just such a remarkable creation. I like to go back and re-read the series every few years. I think I’m due for an appointment.